Our most popular theme! Sweet Kisses baby is designed perfectly for cuddles with a super soft body and a fresh scent. Her clothing is the softest cotton and at 16″ she’s appropriately sized for little arms. Her special feature is a light as air kiss when her leg is pressed. This doll makes a great gift. Give the one you love a kiss today! All Nenuco babies are mildly scented. Your little one wants to be just like you. Nenuco dolls provide aspirational role play for children of all ages to interact with their dolls in fun everyday ways…just like a real mommy. 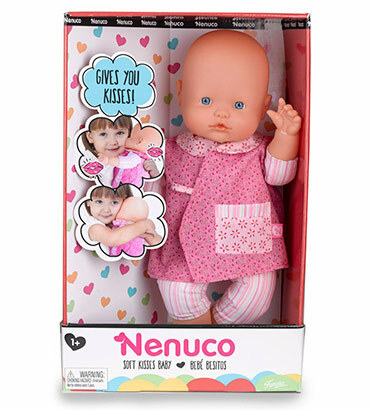 Nenuco is the doll brand that moms have been giving their daughters for over 50 years. Start your tradition today.